Should you want to take a break from all the busy nightlife of the eastern Algarve coast, than take a walk through the iron gate at Companhia das Culturas, a secluded guest house with a charming outdoor restaurant surrounded by lush fig trees and an alluring country quiet. Dinner here is made from scratch with fresh in season ingredients, every evening, by a rather creative young chef whose passion for food is evident in every bite. Jossara Martins, works diligently in her country kitchen surrounded by jars of homemade jams, vinegars and liquours she concocts with fruit grown all over the property. Tonight, as a pre-dinner cocktail, we’re having an apricot liquor she’s made without adding any extra alcohol so you can taste the intense flavor of the fruit in its wholesome state, a light spirit with an almost smoothie consistency. Delightful! 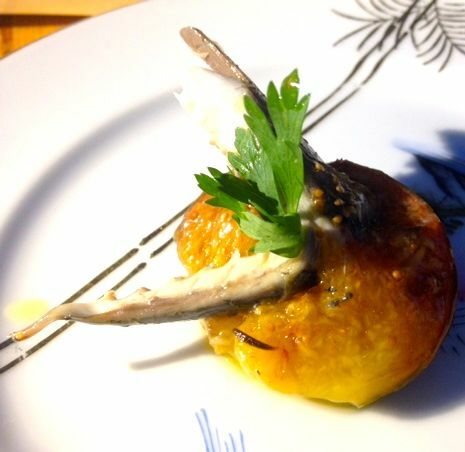 As a starter, we had the carapau alimado sobre figo confitado com vinagre de albaricoque, brined and boiled horse mackerel over fig confit drizzled with apricot vinegar is a clever combination of sweet and sour that pairs fruit and fish ever so tastefully: the tender texture of the mackerel over the sweet and juicy fig made for a genuinely light summer appetizer. Next came the ceviche de cavala com algas e pimento de Padrón, mackerel ceviche and seaweed drizzled with apricot vinegar and sprinkled with sesame seeds, all garnished with a small green Padrón pepper, known for being randomly hot. Fortunately for me, this one wasn’t. 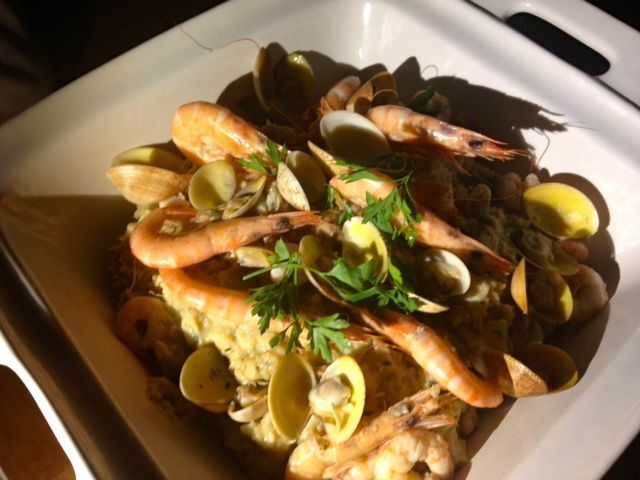 For the main course, we had the açorda de marisco: seafood stew made with country bread. Originally, a poor man’s meal to which was added whatever one could find. In this case, being close to the ocean, seafood is the usual choice. Bread is mixed into a seafood broth and served with clams, shrimp and fresh coriander. 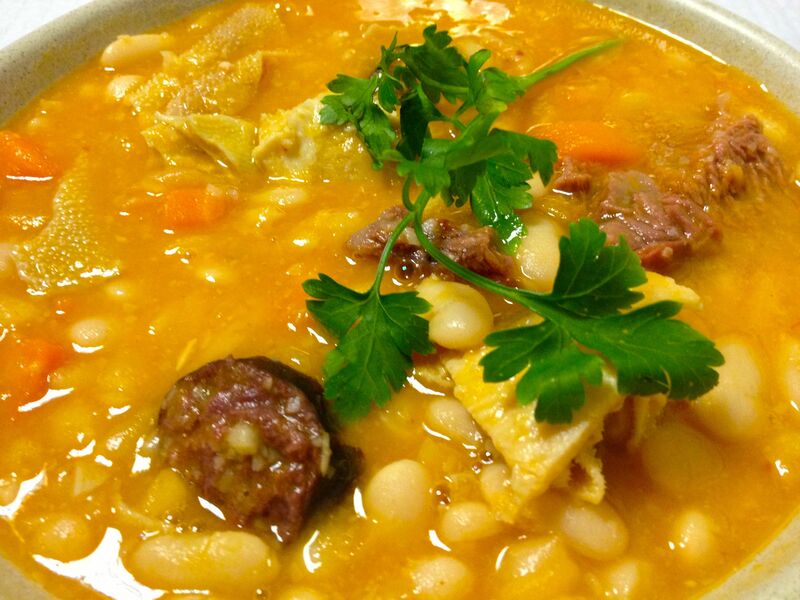 This hearty dish paired with a chilled vinho verde is Portuguese comfort food at its best! 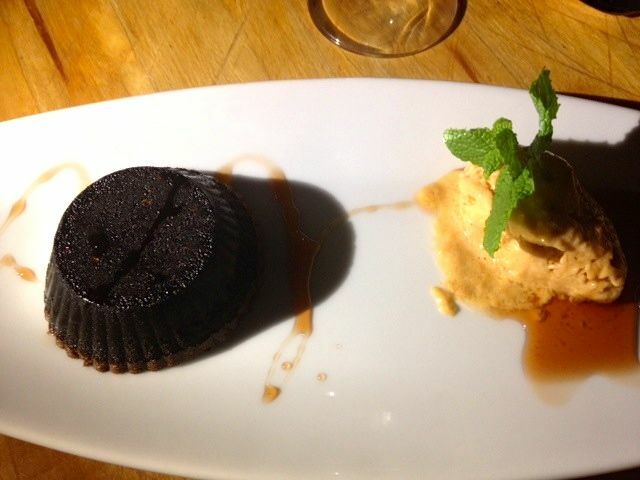 Dessert was an interesting surprise: quindim de alfarroba com sorbete de albaricoque e mel de membrilho., a rather dense carob pudding that was nicely complemented with a light homemade apricot ice-cream churned with evaporated milk, instead of cream, and drizzled with quince syrup. A refreshing ending to a peaceful summer evening in the quiet Algarve countryside! Bica is located right on rua Almirante Candido Reis and although it doesn’t look like much from the outside, take a seat at one of its alley’s tables and you will be pleasantly surprised with the great service and wonderful local food, not to mention the ever so reasonable prices. This place is a true Tavira landmark that has been in business for over forty years and tables fill up rather quickly . A menu consisting of mostly seafood, fish, chicken and meat is served fresh daily for 8 to 12 euros. I ordered the chargrilled chicken for 8.50 euros and although it did take a while to make, I was served some delicious green olives as well as some bread and butter to keep the wait less painful. In many restaurants in Portugal, it can be a while before you get your food because it’s usually made to order from scratch, a habit that makes the whole experience a more gratifying one. Be patient, the Portuguese are! A generous serving of half a chicken seasoned with lemon, garlic and little else, served with homemade french fries and a salad made with lettuce, tomato, onion, carrots and red cabbage. Even though the chicken was tender, moist and deliciously seasoned, I have to mention that what really got me was the wonderful service: diligent and easy going. When it came time to pay my bill, I was a euro short but told not to worry, no big deal! Of course, I’ll be back! Although somewhat hard to find, Casa Gasamáns is one hidden Galician treasure. 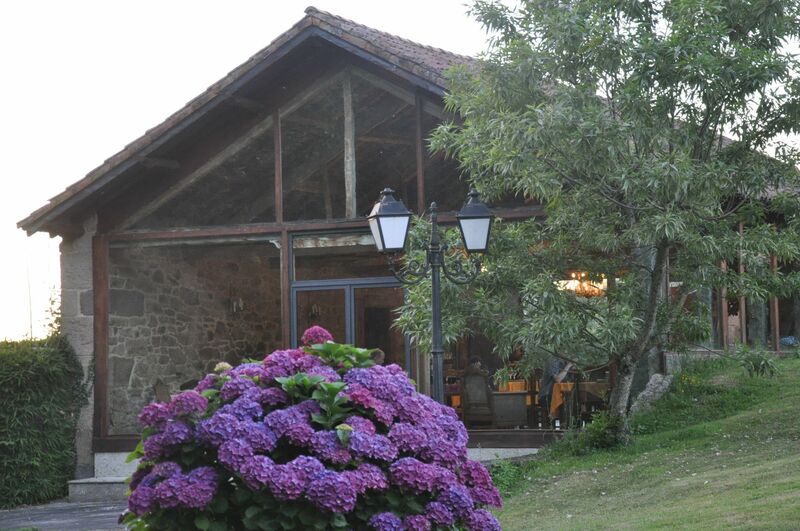 Only a 15 minute drive from Santiago, this enchanting rural house boasts a cozy restaurant nestled in the lovely lush grounds of a gorgeous Galician getaway. 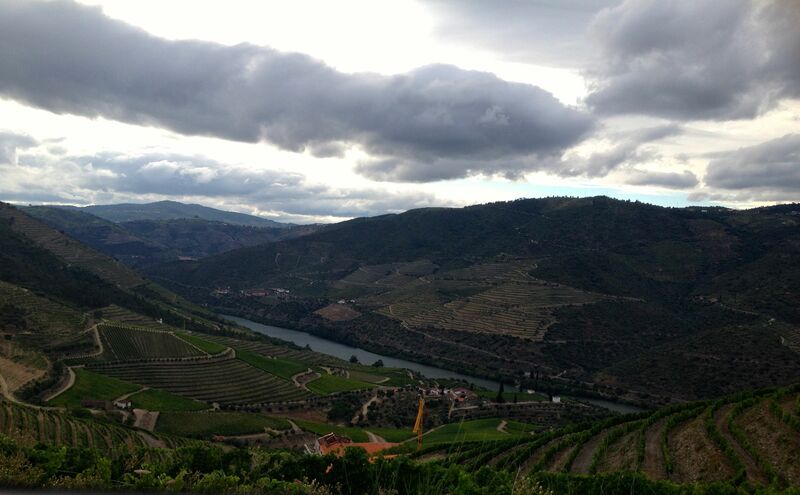 A set menu of local specialties is served daily along with a nice selection of local wines – Ribeiros and Alvarinhos. 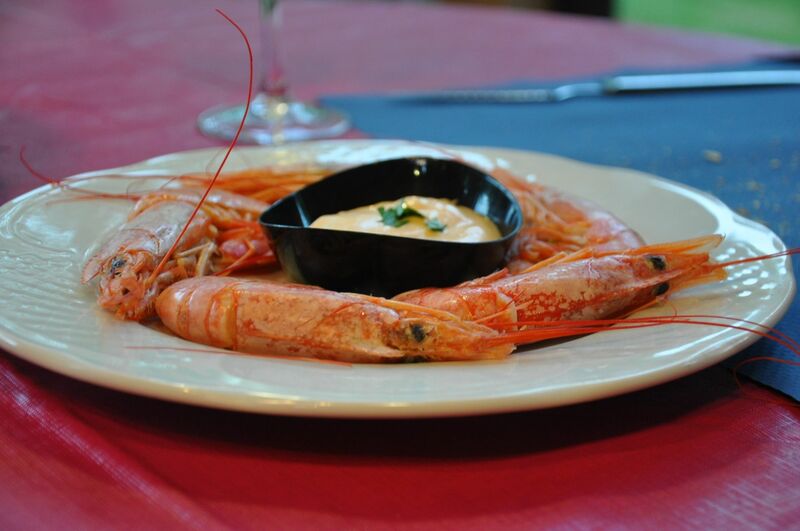 A generous portion of boiled prawns with “salsa rosa” (a mix of mayonnaise, ketchup and cognac) made for a nice starter. 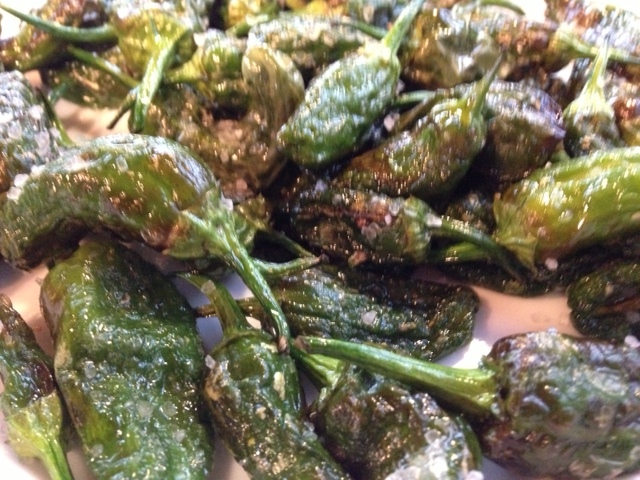 Along came a generous serving of pimientos de Padrón known for being randomly spicy: some are hot and some are not. 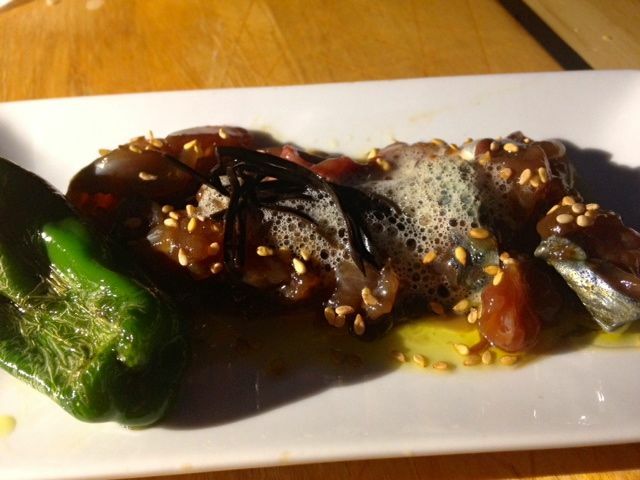 Originally from America, this type of pepper was brought to Galicia by Franciscan monks in the XVI century. These I had, being from the beginning of the season, May through September, were rather mild yet delicious! 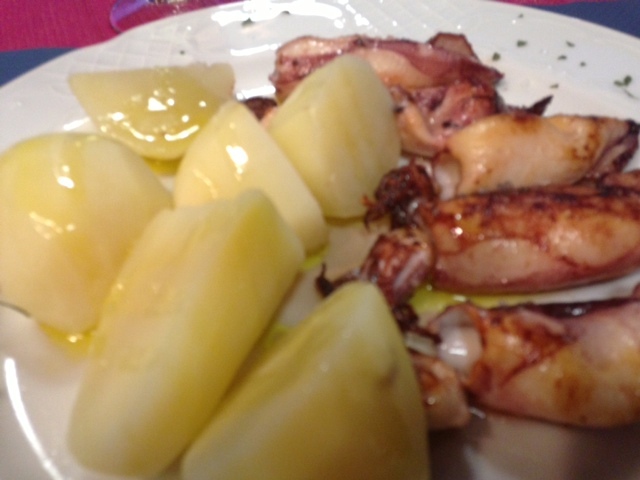 For seconds, I had grilled squid lightly seasoned with paprika and a side of boiled potatoes simply drizzled with olive oil. The simplicity of this dish is exactly what makes it so flavorful because you can actually taste the freshly caught squid that is grilled ever so carefully to make it melt in you mouth tender. 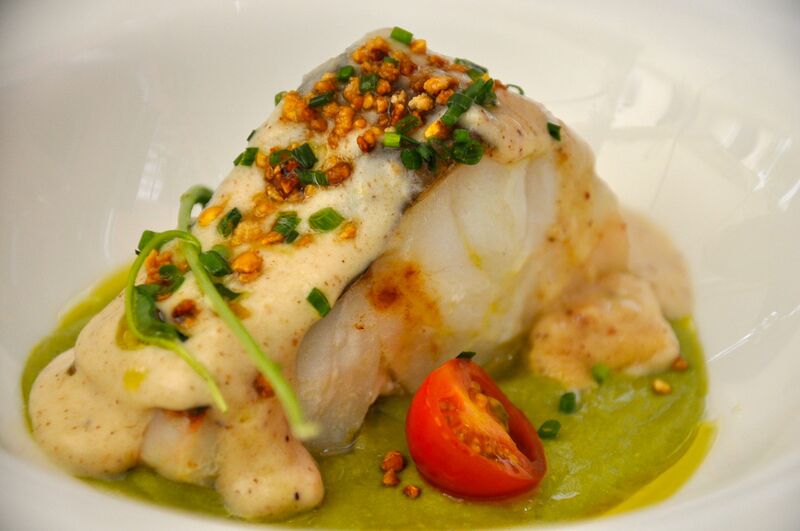 There’s nothing like fresh seafood from the north Atlantic and that is exactly what Galicia is all about! To finish my meal, I was offered a glass of a local spirit known as Orujo, a pomace brandy that is a surprisingly smooth digestif. Back in the XVI century, the Portuguese Jewish community, following tradition, did not eat sausage because it was made with pork. During the inquisition, in the Trás os Montes region, one way of finding the “conversos”, those who had converted to christianism but still practiced judaism, was by noticing that they had no sausages hanging from their smoke houses. So, in order to go unnoticed, they came up with their own sausage made with chicken , veal, duck, rabbit and pheasant – the Alheira. The name derives from “alho” , garlic, which is one of the main ingredients along with sweet paprika, breadcrumbs olive oil and salt. Milder in flavor and less pungent than chouriço or linguiça, the alheira has become a highly popular dish in Portuguese cuisine. Many varieties have derived from it so you will now even find some made with pork. Served half open on a bed of salad, garnished with orange wedges and mint is all you want to accompany a nice glass of red or white Douro wine. 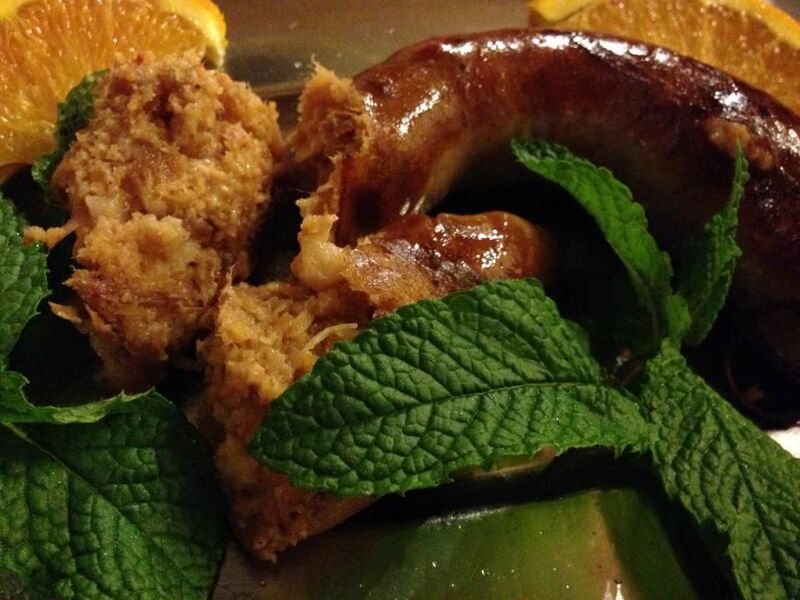 A homage to Jewish culture, known for its innovative qualities, the alheira is the result of how a group of people made the best out a bad “sausage” situation creating thus one of the greatest delicacies of northern Portugal. Yes, I know “tripe” sounds iffy. At least it did to me for many years. My mother was a big fan and every time we went out for tapas in Madrid, she’d order “callos a la madrileńa” which I wouldn’t touch with a ten foot pole. Why now you may ask? Well, I happen to be in Porto a city known for this dish. It’s even become part of its people’s identity as locals are called “tripeiros” because in the old days, they generously shipped their meat out to Portuguese sailors who were sent to fight in Africa in the XV century under the command of Henry the Navigator. Locals were left only with by products and tripe but ingeniously came up with this great stew that I had to try. It was the moment to overcome all that dread that my mother made so much fun of . I had to do it, there was no way that I could come to Porto and not give tripe a chance. I was lucky enough to be guided by Raquel and her friend Rui who kindly led me to a great “tasca” on rua das Taipas in the Cordoeiro neighborhood, close to the Jewish quarter. 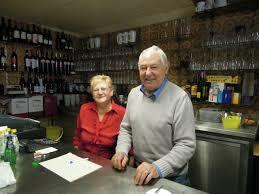 Tasca do Rei dos Galos de Amarante, a family run joint that has been in business for over 47 years. Husband Dom Rodrigo and wife Dona Maria Rosa have been serving locals the best in homemade Porto cuisine for almost five decades, becoming a gathering point for university professors and students who swamped the place in the early 80’s. Bits of honeycomb tripe, a cow’s stomach lining – yes, that’s what it is – mixed with linguiça ( smoked sausage) and blood pudding in a white bean stew. Added to this is the delicious “salpicão” a sausage that is a mix of beef and pork loin made with wine, garlic and paprika which adds a whole lot of flavor to this dish. Usually served with a side of white rice, “tripas á moda do Porto” is hearty and meant to keep you satisfied for a long time. I have to admit, it took me a few minutes to try it but once I got through the chewy part, I actually enjoyed it. With the help of a nice glass of vinho verde, I mustered the courage to finish it up and I have to say it was delicious. Overcome your fears like I did, give tripe a try! At least in Porto. The Barrio de Santa Cruz is perhaps the most enigmatic neighborhood in Sevilla. A gorgeous maze of winding streets that fills with tourists all day long and all year long. 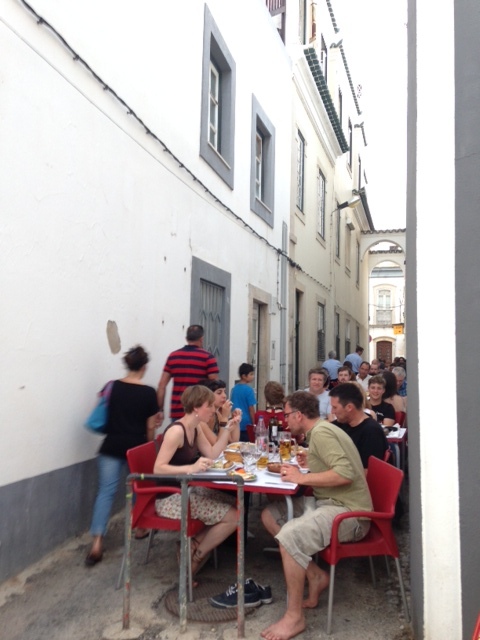 Bordering the world heritage Giralda, it is bound to fill with hungry visitors at any time of day. Exactly an area I would rather avoid unless there is good reason to visit one of its ever so busy restaurants. In the case of the Azotea, there was. 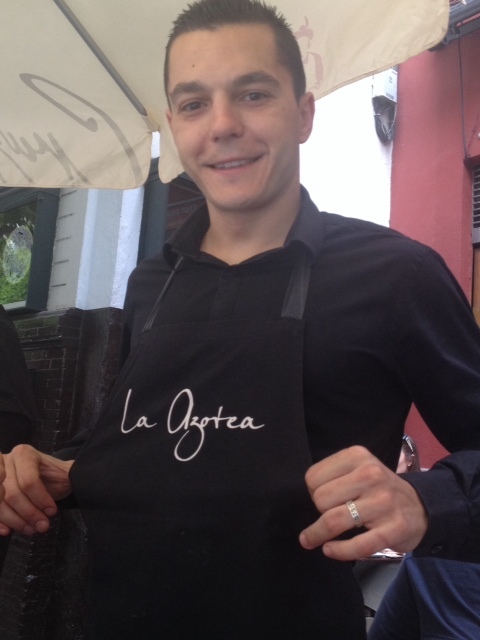 Highly recommended by Juanma, a good friend from Sevilla, I couldn’t say no and so I headed there hoping to find something interesting to eat. I sat at one of its outdoor tables feeling like one more tourist; hungry and very distracted by all the beauty Sevilla has to offer. It was hot and a tall glass of tinto de verano was in order. I looked through the menu and found an eclectic selection of traditional food and some more unusual dishes like the Bacalao con hummus de albahaca, codfish with basil hummus for €8.00, a braised fillet of flaky cod covered with a light béchamel sprinkled with chopped almonds, all served over homemade basil hummus. I knew it had to be good if Juanma had recommended it and, I have to admit, it was outstanding!